What's cookin tonite, friends? 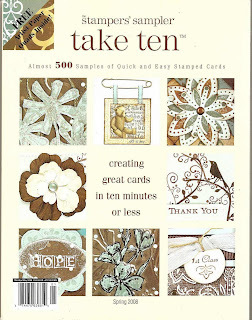 Tonite I thought I'd post some Crafty Secrets cards that I made for an article in Take 10 magazine's Spring issue. I was so excited when I got the magazine in the mail a few weeks ago! The cards were all done using a "masterboard", also known as a "one sheet wonder". Full details on how to make each of these coffee chickie cards as well as creating the masterboard are found in this issue. There are SUCH rockstar stampers in it! Jen Del Muro has some cute bunny treat bags in here, and Lori Craig has her awesome split negative cards in there too! All of the cards were done using the Crafty Secrets Coffee & Tea girls. I did these at the cabin last summer, and wistfully remember sitting in the screened-in gazebo, putting cards and instructions together for the article. SOON, VERY SOON it will be summer and warm weather and barbeques! I'm SO ready for it! Congrats on being in that great magazine. I look forward to flippng through it as soon as it arrives ... it'll be great to see you in there. Congrats!! Such a great magazine!! Your cards all came really cute! Congratulations on being published! Rock star......You are my Rock Star. Iwill definitely look for this issue and buy it. Looks so fun. And thanks for explaining what a masterboard is. HUGS and HIGH FIVES! I'm so proud of you Zappy! And so happy for you! YOU DESERVE THIS FAME! You are a ROCKSTAR! Congratulations LZ. This is such an awesome bunch of cards. You're famousssssssssssss! Oh my gosh! Zappy, I MUST go find this issue! At last, at long last an entire article about your endearing creations!! Yup, others have said it....you truly ARE a ROCKSTAR stamper, girlfriend! Congratulations!!! I have looked at that over and over again -- love the colors and those awesome CS images! Even persuaded me to buy those stamps -- you're good, sister!!! Gorgeous stuff as usual!!!!!!!!!! WOW! Wow! I have this issue and love love love it! Your two page spread of cards rocks!! Congrats Lisa! Fantastic work ..as always Lisa!! Congrats on the pub!